Finally, Leap Year explained (thanks to Sara and some more great Morph animation use!). Happy Leap Year, February 29th! We let the TLC Creative Presentation Design Team loose to experiment with PowerPoint 2016’s new Morph transition/animation – the results are fun, great and inspirational! Here is our design team’s Morph ideas compiled and output as a video. 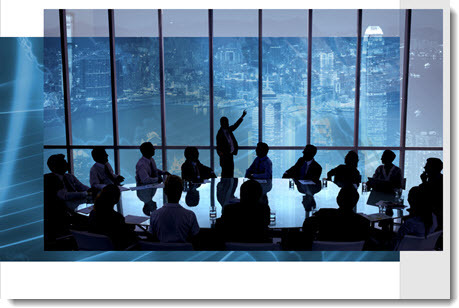 Both programs get new features automatically added to Office programs such as: PowerPoint, Word, Outlook, Skype, Excel. 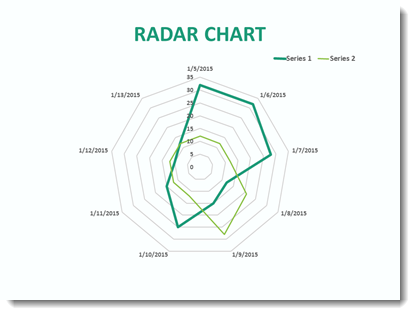 The Office Insider program is free and easy to add to your subscription. 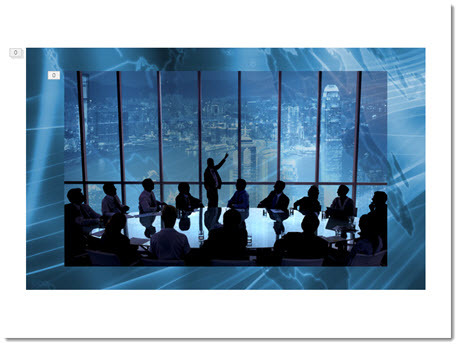 The Office Insider program includes: PowerPoint for Windows Desktop, Mac, Android, and Mobile. 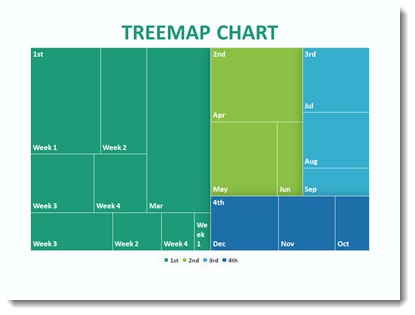 This example is based on Office 365 Business, which is the version we use at TLC. 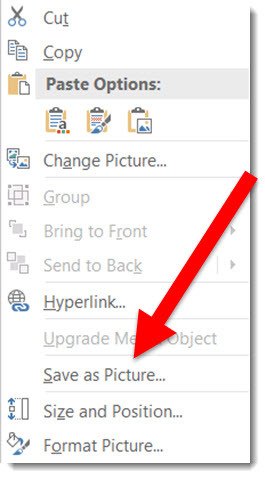 Your subscription might be different so take a look at the version of Office 365 you have. 1. Log into your Office 365 account to access the Admin Center (Note: The Admin option is only available to those with admin permissions). This Account Admin is not the same as the individual Admin inside PowerPoint or any Office app. 2. Go to the Account Admin > SERVICE SETTINGS > UPDATES > NEW FEATURES AND UPDATES > EARLY RELEASE and select the option you want. First, Office 365 Home, Personal, or University subscribers get the updates. Next, Office 365 Business subscribers, that do not have Admin restrictions, receive early release features. 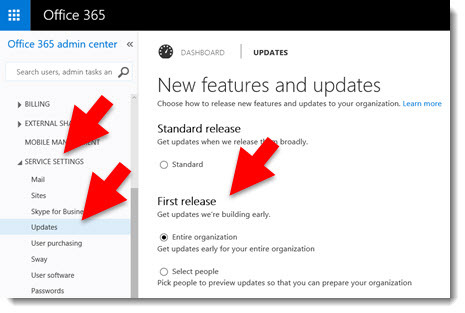 And finally, approximately 3-5 weeks later, the new features will install to all O365 subscribers. 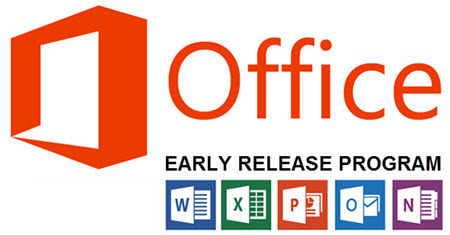 Here is a page with details for Office 365 Early Release Options. Here is a page that details each of the Office 365 Subscription Options . My example is a standard 4×3 slide. The goal was to create a picture frame that was full slide size and for the picture frame to have motion. By layering a video under the photo and sizing it to the same aspect ratio as the photo, the result is a dynamic motion picture frame. The steps to make it happen are pretty easy. Add the photo to the slide (we prepped this image in Photoshop by making it semi-transparent and saving out as a .png). 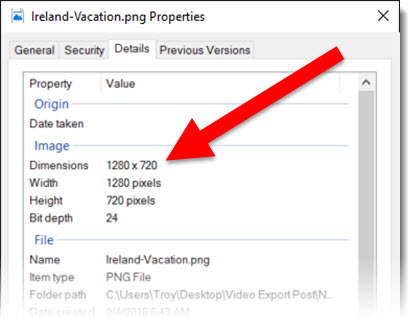 Add the video to the slide, send to back, resize and crop to proportionally be a bit larger than the photo. Fine tune position of video and photo. Select both and use the ARRANGE > ALIGN > ALIGN CENTER and ALIGN MIDDLE to make them exactly centered on each other. Set video animation. 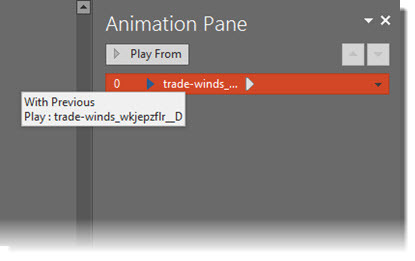 Select the video, remove the current trigger animation, add a new PLAY animation set to WITH PREVIOUS. Set video to loop. Select video, go to PLAYBACK > VIDEO OPTIONS > LOOP UNTIL STOPPED. Stylize video with an outline and drop shadow. Stylize photo with an outline and inner shadow. 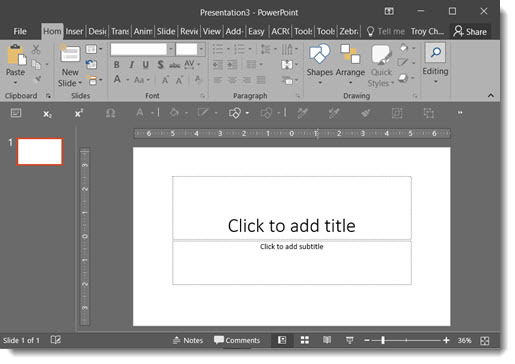 PowerPoint 2016 Auto Layout Designer is a new feature in this version. I wrote a post earlier this month with a review and example. It really is a great feature. But, if you do not use Microsoft templates (or themes) for your presentations, the Designer tool is not helpful. Using a custom template does not stop Designer from popping open its action pane and offering to help design slides (even though it currently cannot). I have opted to turn off the Designer feature – at least until it has expanded use to work with custom templates. 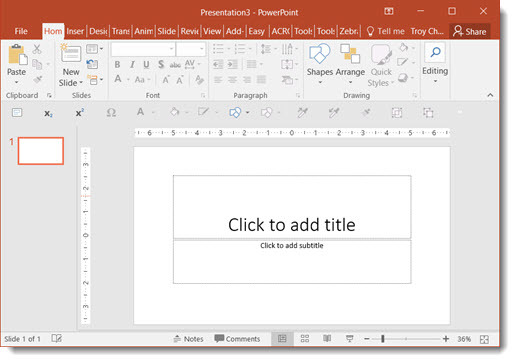 New Chart Types in Powerpoint 2016 for subscription users of Office 365 are being automatically added to your app (Note: This is only in subscription users of Office 365, PowerPoint 2016, and I have only looked at the Windows version). 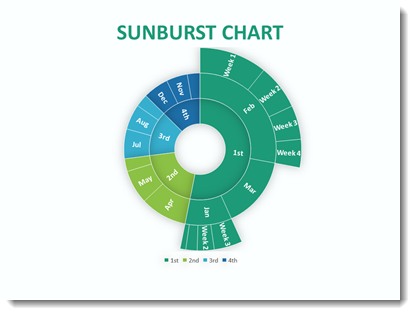 Here are 4 of the new chart types currently available (we will continue to see more chart variations added over time, look for another new chart type in the February updates). 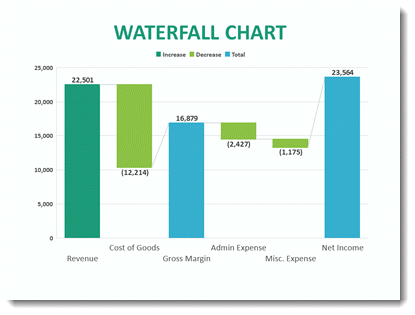 That same data in the Bar Chart can instantly be updated. 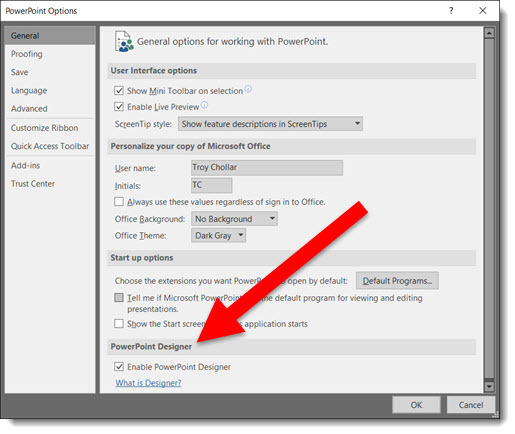 This a great addition to the native PowerPoint chart options vs. going to external charting apps to develop. 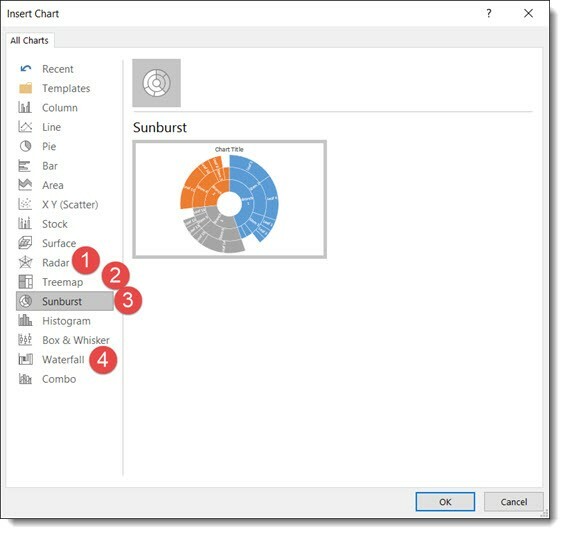 This Chart is new to PowerPoint 2016 native chart options. 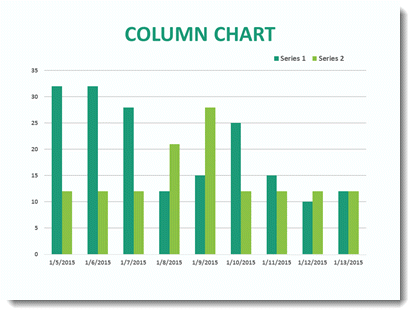 This standard Column chart with negative data. 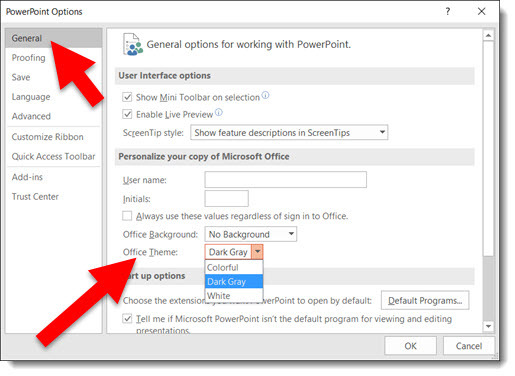 PowerPoint 2016 User Interface Color Options allow you to modify your interface by choosing up to 3 preset color schemes: Colorful (Orange), Dark Grey, White. 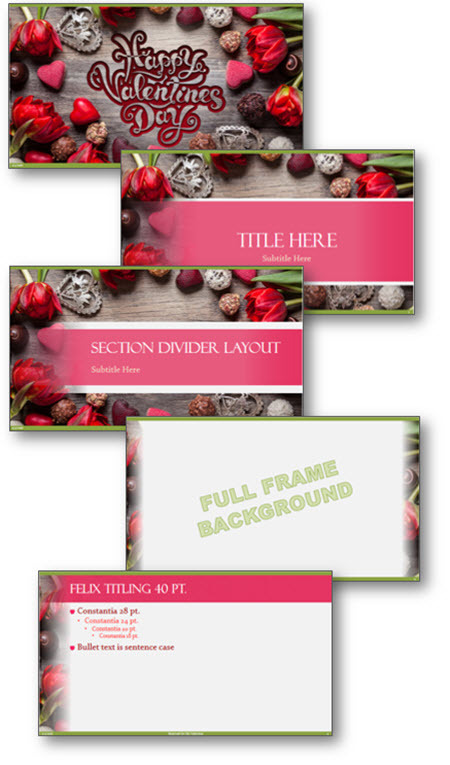 You can change the ribbon, border and canvas area outside the slide. To adjust, go to FILE > OPTIONS > GENERAL tab. Then, go to OFFICE THEME drop down menu. Image Export Improvements in Powerpoint 2016 have made things more interesting. Depending on previous version used, this may have been an okay result to a not-so-good result. 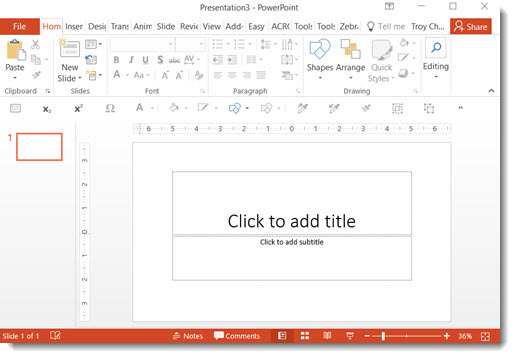 But that has changed for the better with PowerPoint 2016. 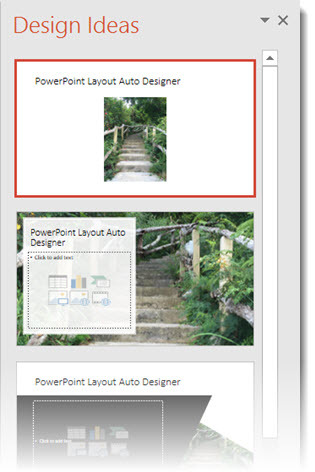 Here is my sample slide to demo the PowerPoint 2016 image export. Single widescreen slide (13.33″x7.5″) with a full frame image. 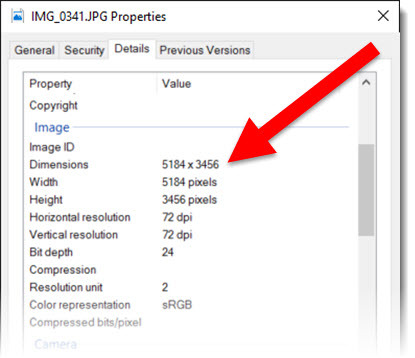 The original image inserted was very large (for PowerPoint needs) at 5184x3456px. A great way to export a number of slides as images is through the SAVE AS option. 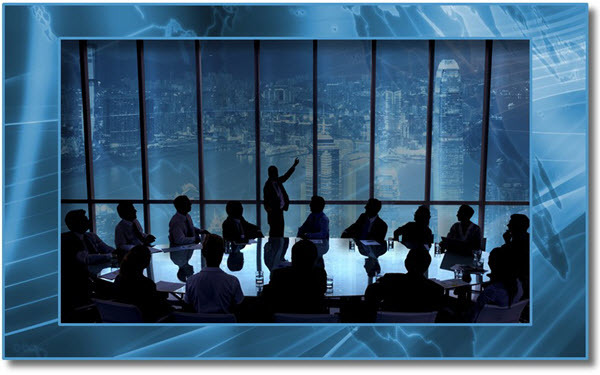 This export option can be used for a single slide, a selection of slides, or an entire presentation. Go to FILE > SAVE AS > and click the SAVE TO TYPE drop down. From the available list, select .PNG or .JPG format (personal preference). Exporting this way creates good image at 1280×720 – the low end of HD resolution. To export a single image, not a full slide, multiple images or slides. The advantage is a much higher resolution image. Select the image, right click and select SAVE AS PICTURE. Exporting this way creates a much higher resolution image (depending on the original image size). This image exported to 2000x1122px. The 2 options are available and use based on what is needed. I will also say that when working with very unique page sizes (e.g. 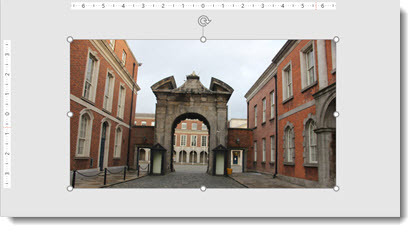 50″x 9″), slide export as images do a much better job than previous versions. 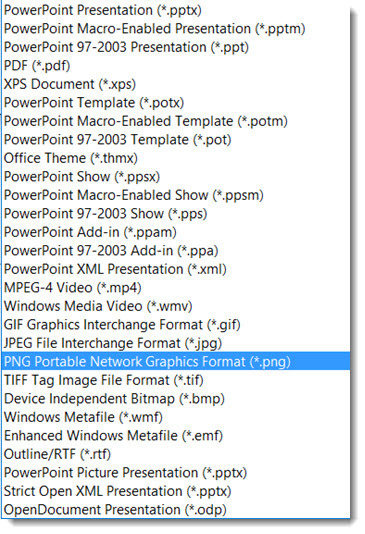 Note: there are several 3rd party add-ins that export slides as images in a variety of formats and to any pixel size needed (Here at TLC Creative, all computers have PPTools Image Export installed). 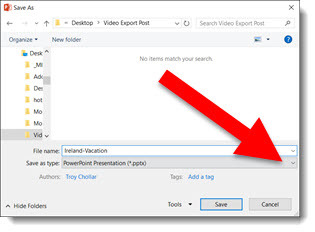 Another behind the scenes upgrade in PowerPoint 2016 is the video export size options. 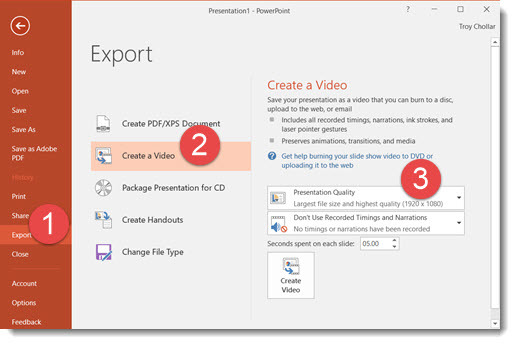 Now true, 1920×1080 HD video can be exported from PowerPoint. The export size options have been revised to 1920×1080, 1280×720 (the PPT 2013 highest res option), and 852×480. Everyone at TLC Creative Services wants you to have a wonderful Valentine’s Day this weekend! For your valentine (class, office announcements, etc. 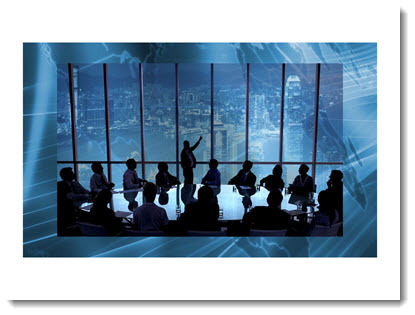 ), here is a professional, full featured PowerPoint template to download and use – for Free!